Farmhouse decor is such a timeless and elegant choice for any home interior. It’s pretty fool-proof and fun for anyone new to home decor projects to play around with. I’ve redecorated our apartment so many times over the years and always come back to the simple and beautiful accents of farmhouse living. I love walking into an airy, bright and light space filled with practical yet earthy touches! The newly expanded home decor section over at Stage now includes even more great interior decoration, furniture, and organization items! Spring is an ideal time to revamp and renew the energy of your living space. I’ve taken all the guesswork out in today’s post. I found some of the most gorgeous choices from the Farmhouse Living section on Stage (online but also in store if you’re close to one!) and put together some ideas for Spring Decor Inspiration using Farmhouse Accents! *This post is a collaboration with Stage Stores. All thoughts and opinions are my own (read more here on this!). Our style already leans towards farmhouse decor; natural and warm are words that would describe our space. I looked for items that would either fit that description or else pop out against those hues. We have a lot going on in our communal living area. It’s home to the entry way, my desk corner, the kitchen table and the TV/family zone. I like it to feel fluid but also separate! 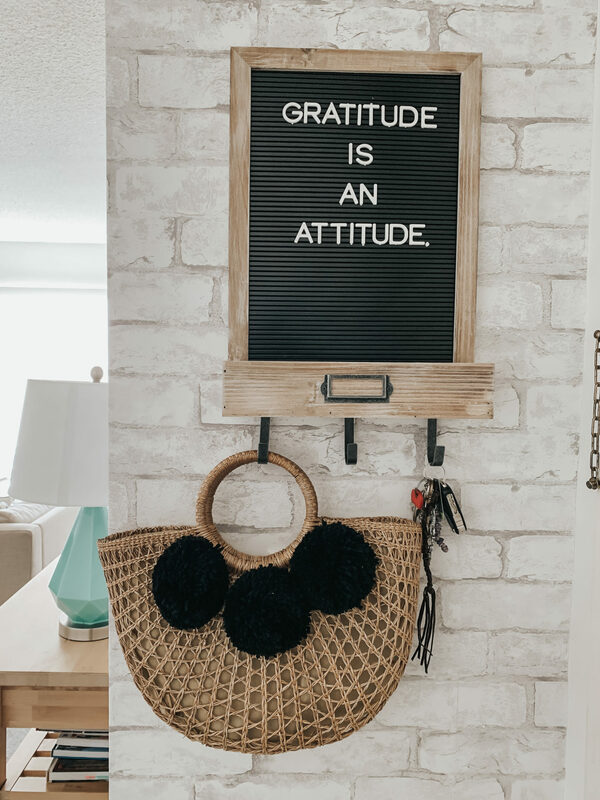 As soon as you walk in, you’re greeted by this gorgeous letter board! These are so on trend at the moment. I always stop and read them when I see them in Instagram posts! 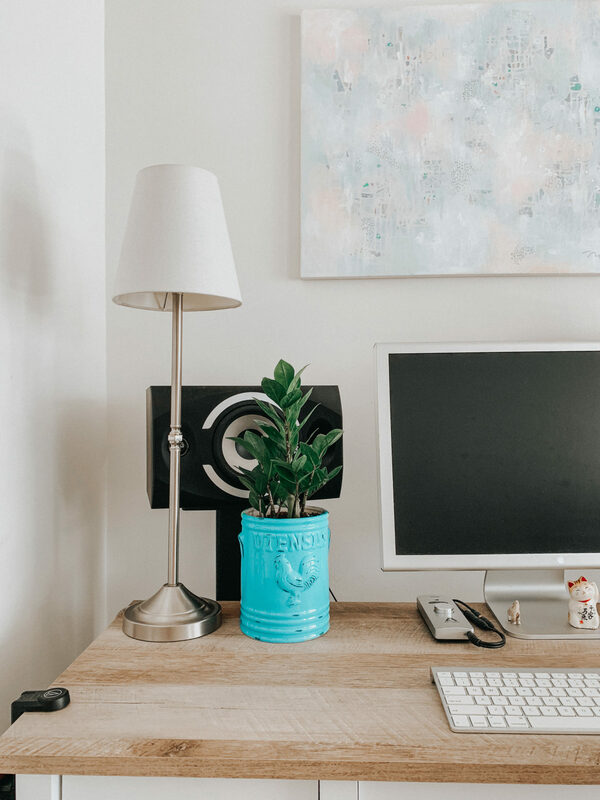 They’re a really cute way of bringing daily inspiration into the home environment. We love playing around with fun messages on it. 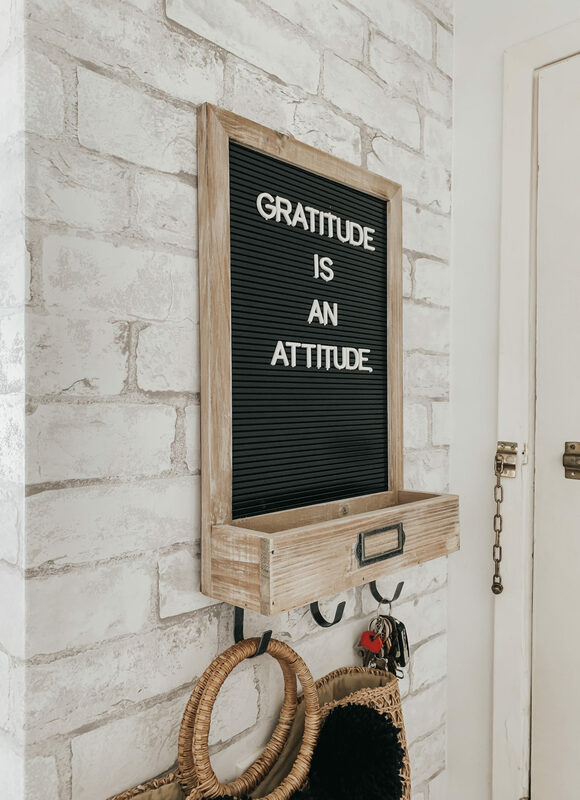 I went with “Gratitude is an attitude” to remind myself to begin my day that way. This board is so practical because we also really needed something with hanging hooks by the door! It makes for an interesting entry way piece right when guests walk in too. And it looks so cute popping against the textured faux brick wallpaper! Moving on to my workspace where I repurposed this large bold utensils crock to house my baby eternity plant. 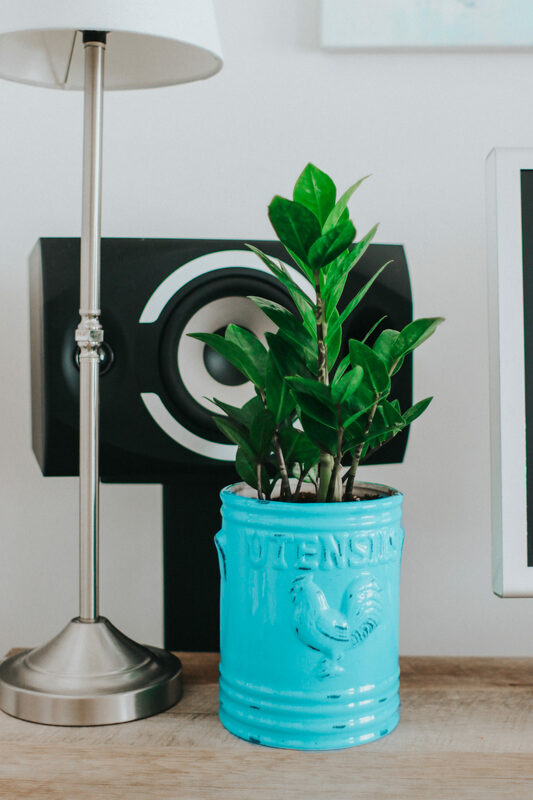 Nothing says Spring like bringing greenery and plants into your home for the season! The eternity plant has such a pretty green hue to it and really brightens up this corner. I spend a lot of time here. It’s a very important and productive space. I need it to be conducive to focus, growth and inspiration! That’s why I put extra good energy into this area. One of the spirits of farmhouse living is repurposing things so this is a different take on a traditional pot for my little green friend! 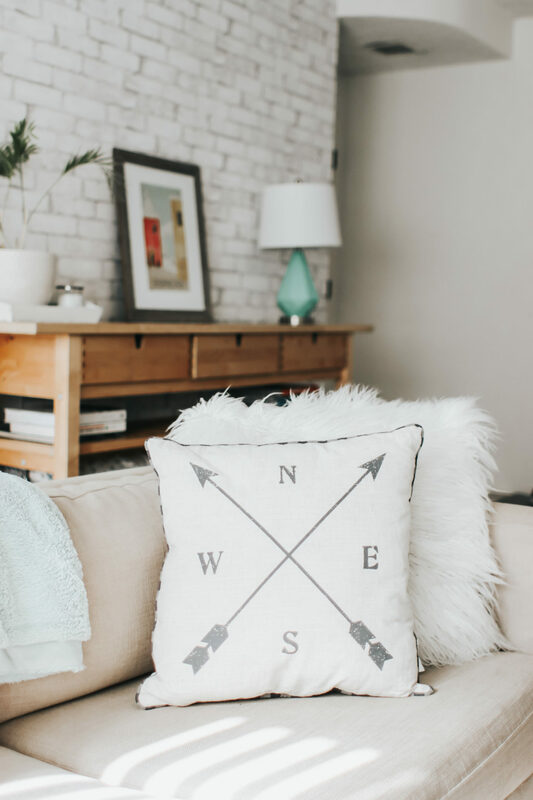 I fell in love with this compass throw cushion when I saw it! I knew it was the perfect color tone to match our light beige sofa. Throw cushions are one of those things that get worn out quickly – even more so with our 2 year old toddler jumping around on the couch daily! 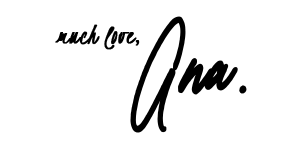 It was time for a revamp. The neutrals and simplicity of this cushion create a nice harmony between modern and farmhouse decor. The linen texture just pops nicely with the shaggy cushion behind it! 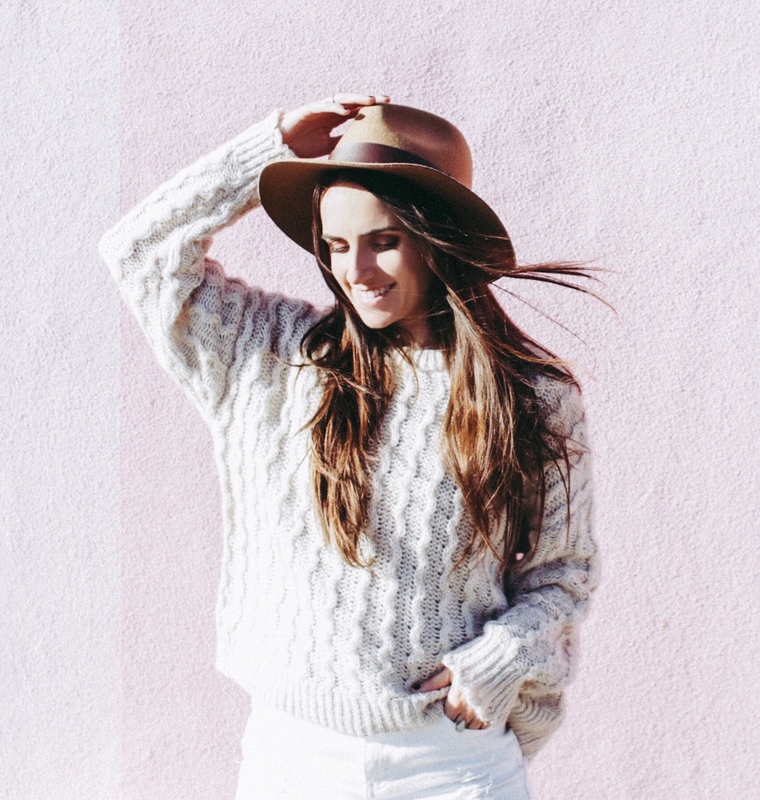 So easy to style! The kitchen is where I love to go crazy with everything; accent pieces, updated plates, bowls, mugs, you name it! We had a super basic red clock that we got forever ago when we moved in so I decided it was time for a change. Enter adorable antique contour wall clock! It’s a great choice for our small kitchen – just the right size. 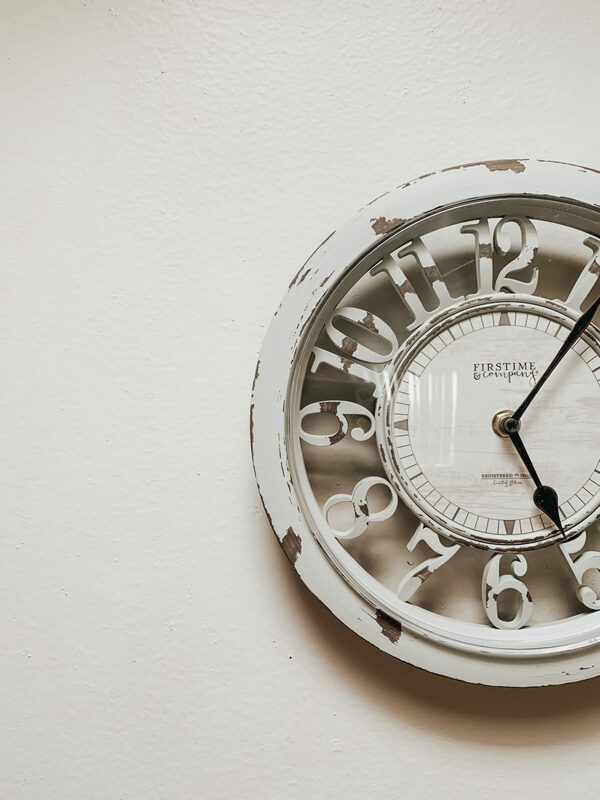 This summer I plan to repaint our cabinets and the main wall of the kitchen so soon enough this clock will pop even more against a new color! 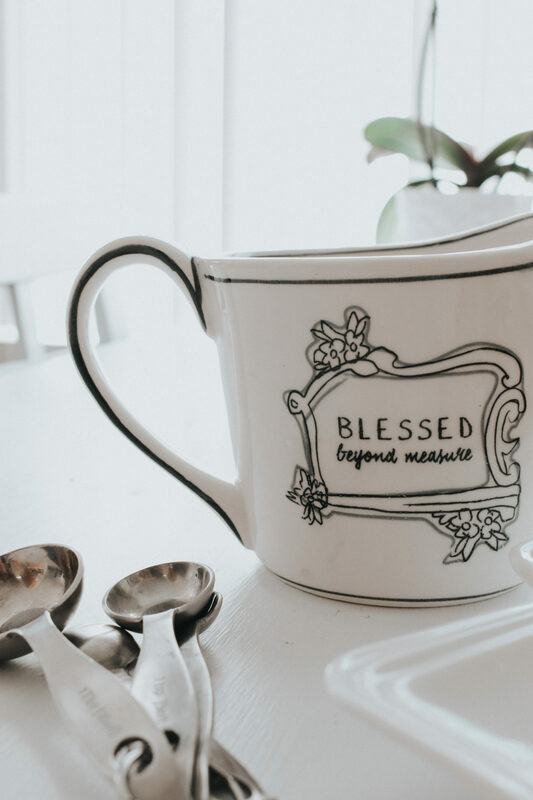 When I think of farmhouse, I think of home cooking and that’s exactly why I couldn’t resist this beautiful “Blessed Beyond Measure” measuring cup. How cute is it!? And it’s a great size! 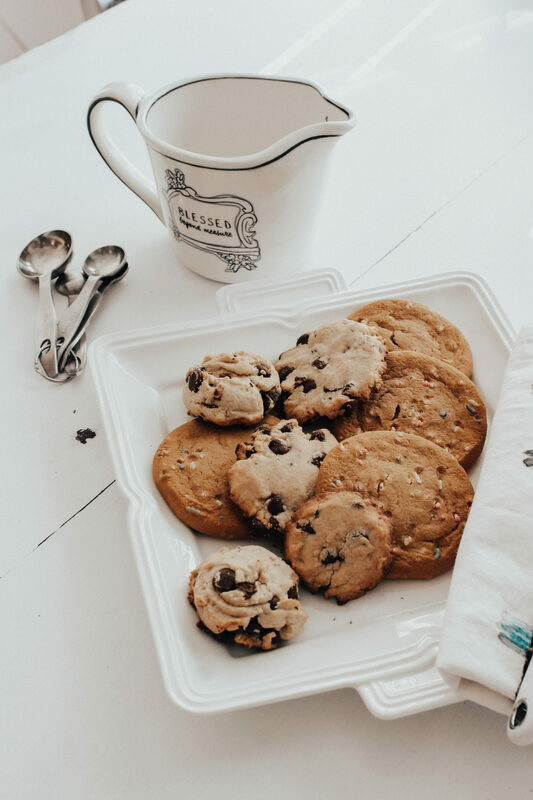 Since I love to bake, I figured it would only be right to get a crisp white dessert tray in the mix for things like brownies, cookies and more delicious baking projects. Yummy! A Spring table is always more chic with a touch of farmhouse, amiright!? 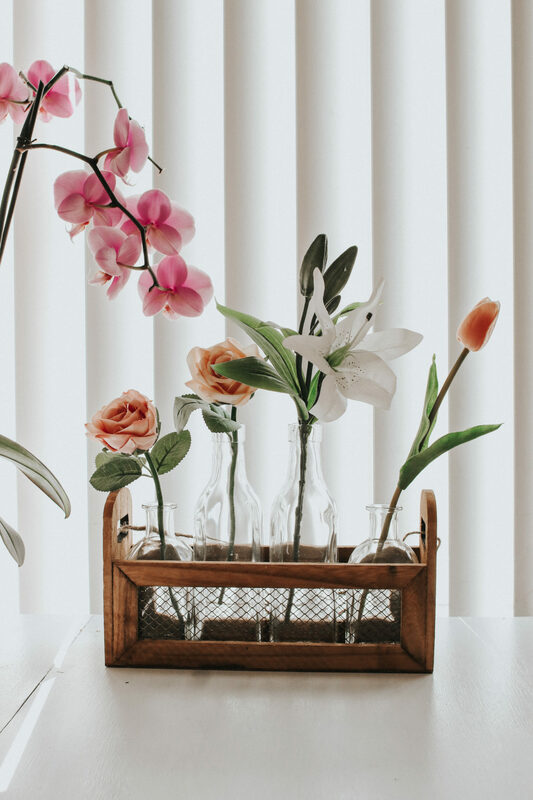 Isn’t this little wooden bottle rack so cute? I added some faux flowers to brighten it up but honestly, it stands alone beautifully too. I love how rustic it is with the chicken wiring panel and jute string! The tall and short bottles bring an element of height and dimension to frame nicely against our (super plain!) window. LOVE! P.S. Can we just pause for a second and appreciate how well my orchids bloomed this year?! So happy! 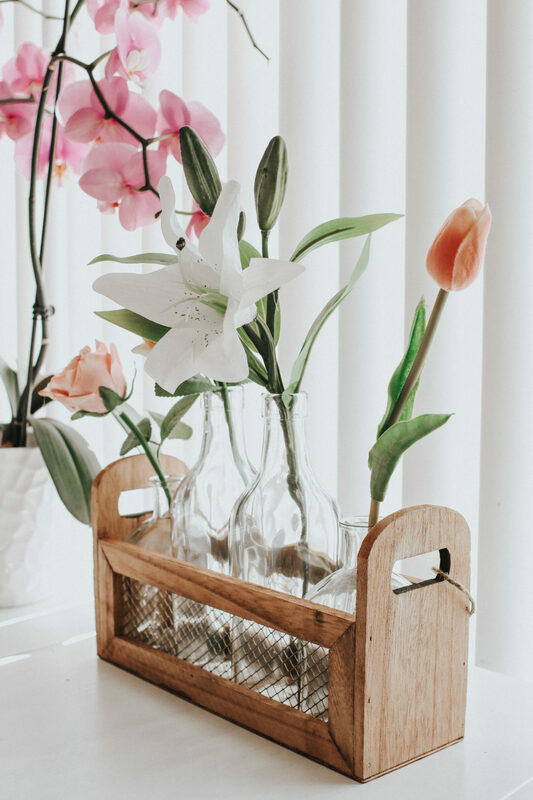 That’s all for my Spring Decor Inspiration: Farmhouse Accents idea! I had so much fun putting these ideas together and just wanted to show you how even the smallest touches can make a big difference. Honestly, seasonal decor doesn’t have to come at a huge cost (Stage always have great prices!) and modern farmhouse decor is really what speaks to my heart and soul when I think of a cozy and welcoming home! 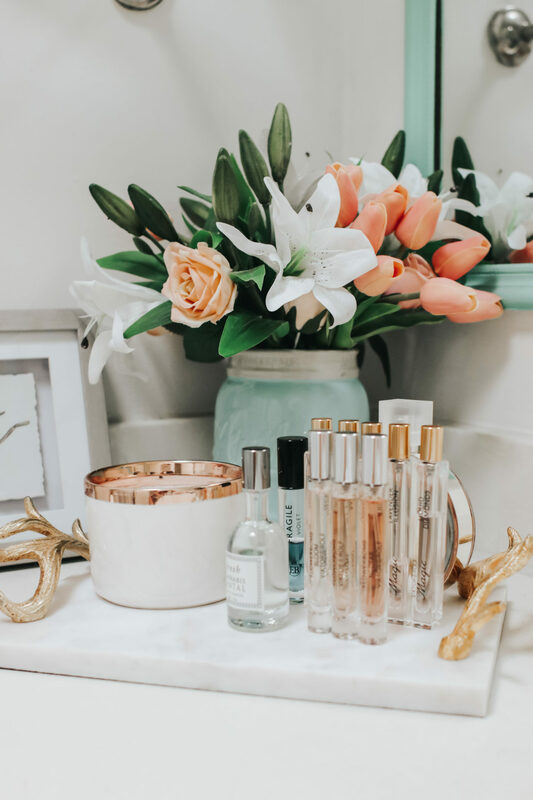 Hope you have an amazing week and please leave a comment below with what your go-to decor style is! See you soon over on Instagram + Stories! Spring Outfit Idea: My Current Go-To! Cute ideas girl! 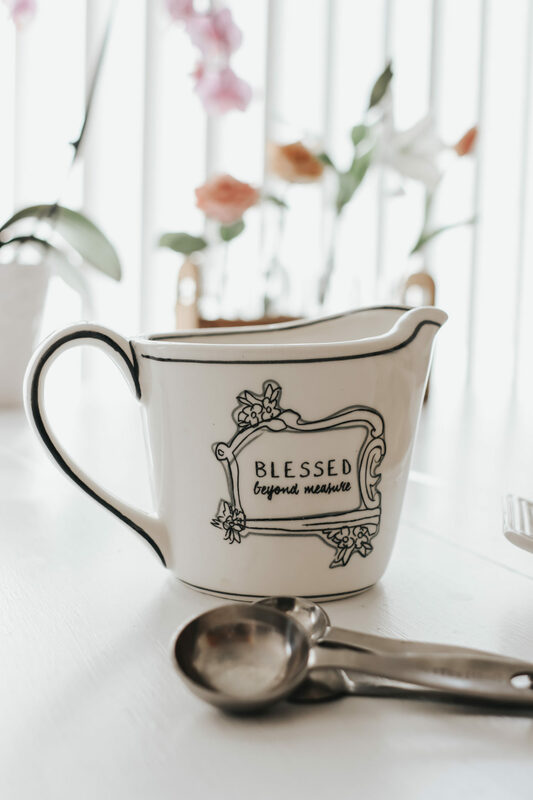 I love the measuring cup, a great addition to the kitchen closets! 👌🏻 Love this post! What a lovely post! Beautiful choice of things from Farmhouse! Gratitude is an Attitude!! I LOVE THAT!